Brett Luke | The Journal Gazette DeQuan Jones of the Mad Ants drives against the Windy City Bulls at Memorial Coliseum. 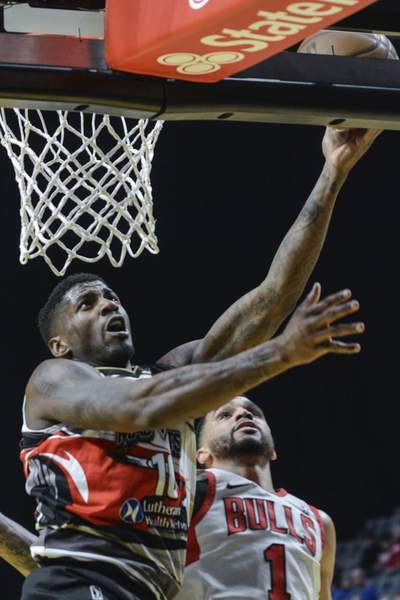 DeQuan Jones, who averaged 18.4 points and 4.9 rebounds during the regular season for the Mad Ants, was selected the G League’s Most Improved Player by league coaches and general managers. The award was announced today, in advance of the Mad Ants’ 7 p.m. game today at Memorial Coliseum against the Erie BayHawks. The winner of that game advances to the Eastern Conference Finals against Raptors 905. It will be interesting to see if Jones or teammate Walt Lemon Jr. factor in the MVP voting at all. As much as I hate this sort of thing, it would make a lot of sense for them to be Co-MVPs of the league, when you consider Lemon carried the Mad Ants the first half of the season and Jones during the second half. I haven’t gotten a clear picture as to when the MVP vote will be announced, but it will be either this week or next week. As for tonight’s game, the player who I really will be keeping a close eye on will be Fort Wayne’s Jarrod Uthoff. Against an Erie team that is stocked with some formidable big men, Uthoff will have to be at the top of his game getting rebounds and defending. Ike Anigbogu will have to do the same for the Mad Ants.